Home entertainment review: Hitchcock/Truffaut - A thrilling celebration of a masterwork | SWITCH. There are few meetings as legendary in the history of cinema as the eight-day interview of Alfred Hitchcock by French New Wave director François Truffaut in 1962. Dissecting each of Hitchcock’s films up until that point, the interview was transcribed by Truffault into his book ‘Hitchcock/Truffaut', regarded by many as one of the greatest books about cinema ever published. Using a wealth of documentation and the master works of the directors themselves, the documentary adaptation of ‘Hitchcock/Truffaut’ weaves a kind of film lover's miracle that both celebrates and builds on it. As a book, the importance of 'Hitchcock/Truffaut' to our understanding of cinema can't be overstated. By allowing Hitchcock the chance to dissect each of his films in intricate detail, Truffaut not only offered the first legitimate study of the master filmmaker's work, but a deep analysis of the craft of filmmaking. Before its publication, Hitchcock's films were mostly seen as populist entertainment, but the combination of Truffaut's inquiry and Hitchcock's eloquence unearthed for readers the complex mechanisms behind his films. They were no longer just fun thrill rides but complex, highly crafted works of art, and revealed for one of the first times what the role and power of a director actually was. In many ways, the book become a foundation stone for filmmaking that is still referenced by directors today. Kent Jones' acclaimed documentary ends up functioning on a number of levels - as a history of the interviews and the book themselves, as a kind of adaptation of the book, and as an extension of it. We're shown how the relationship between the two directors developed and how the interviews came to take place, but added to the mix are observations from some of the greatest directors working today from around the world (Fincher, Scorsese, Anderson, Assayes and many more), talking about their relationship with the book and offering their own further analysis of the films. What we end up with is a glorious kaleidoscope, a celebration of the cinematic form whose specificity in looking at two artists in particular says just as much about the medium as a whole. Handsomely shot and edited with tremendous energy and wit, the film combines archival footage, images and audio, contemporary interviews and a raft of clips from Hitchcock's films. These bring to life much of the discussions in the interviews, sections of the film devoted to specific Hitchcockian techniques and detailed analysis of masterpieces like 'Vertigo' and 'Psycho'. In this sense, the documentary is as much a companion to Truffaut's book as it is a celebration, offering audiences a chance to see Hitchcock's creative process in action. Jones and editor Rachel Reichman are thorough and exacting in their storytelling, making 'Hitchcock/Truffaut' the best documentary about cinema since 'Jodorowsky's Dune', and probably one of the best full stop. What we end up with is a glorious kaleidoscope, a celebration of the cinematic form whose specificity in looking at two artists in particular says just as much about the medium as a whole. What really makes this documentary a film buff's dream though is that, on top of being detailed, exacting and passionate, it's also enormously entertaining. It moves at a cracking pace, crackles with the kind of cheeky wit that makes Hitchcock's films so endearing and doesn't waste a single second. Watching it is like stepping into Truffaut's legendary book, and consequently into the minds of two of the greatest filmmakers in the history of cinema, complemented by the voices of some of the great artists who have followed in their footsteps. It's addictive, intriguing and endlessly rewatchable, and for this film buff at least, a nerdy dream come true. 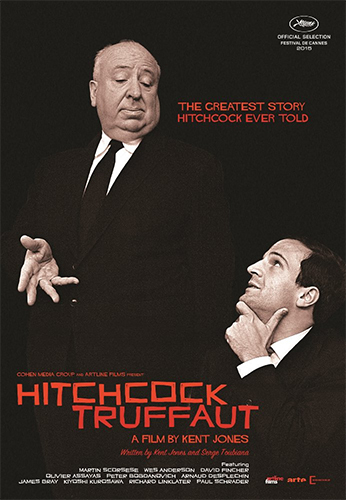 ’Hitchcock/Truffaut’ is now available to rent and buy through the iTunes Store.